If you browse through the many social media sites now available to you at the click of a button, you can be taken off to amazing places, and more often than not if you follow outdoor brands and websites, you will see stunning pictures of people enjoying the outdoors in amazing surroundings. Although you might imagine being there, soaking up the atmosphere and taking in what is laid out before you, more often than not, you just dream a little and carry on reading about what one of your mates is having for tea that night! It is no coincidence that some people seem to have all the luck in the outdoors, standing next to amazing ice formations, watching a whale-tale flap from a canoe, or gazing at a stunning sunset. In fact they too have plenty of gloomy, wet days, which are still enjoyed, but never as dramatic as the “memorable days” and being out in all weathers raises those odds dramatically. Just one such trip was a short visit to the Brecon Beacons we did recently. 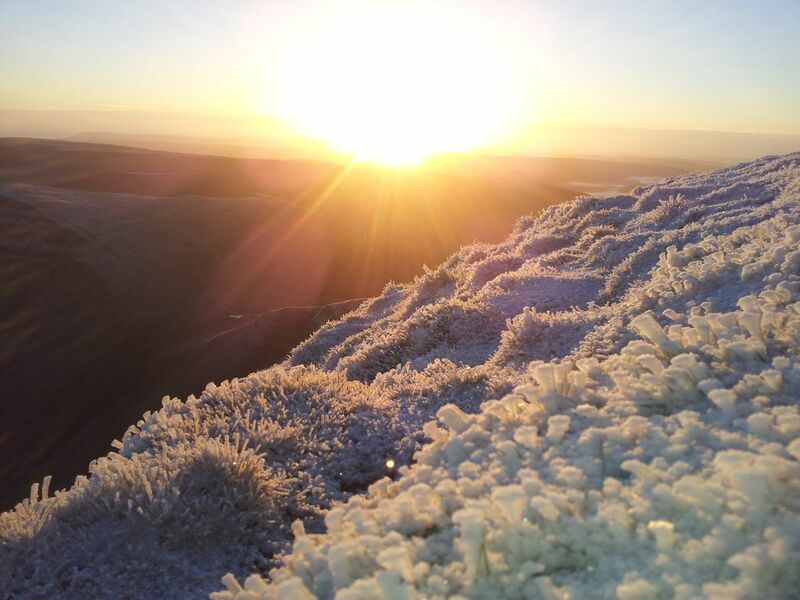 I asked my local adventure buddy Rob Yates if he fancied seeing a winter sunrise on top of the Brecon Beacons, and of course he said yes! We looked at the weather as snow had been predicted and the temperature had dropped quickly to freezing. We picked a Friday night as we were both free, and snow was predicted that night, followed by clear skies. 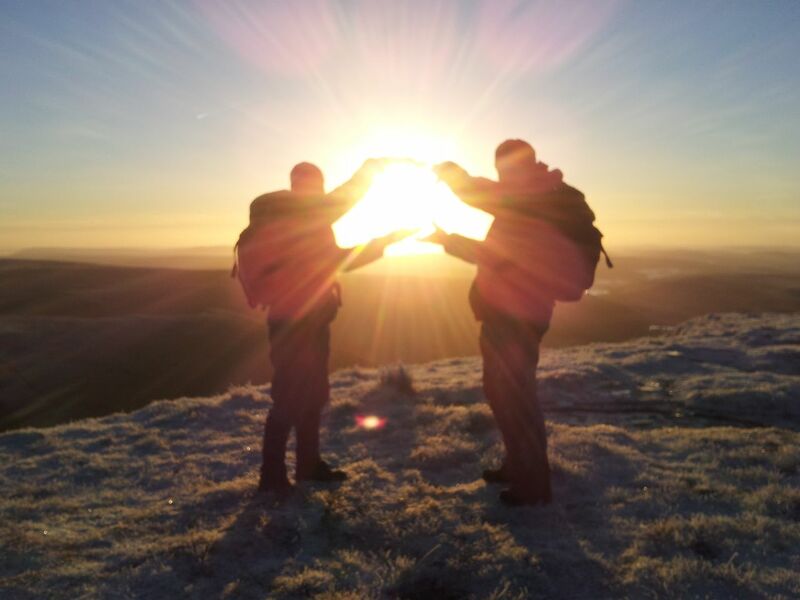 Perfect for a snowy summit with a spectacular sunrise. But as all good plans, the weather has its own ideas, so we would need a little luck too. We arrived in the dark on the Friday night and pitched our 1 man tents on the frozen ground, as quickly as possible as our hands were freezing. We poured a glass of Port to help warm us up. And with a soundtrack of the local owl calling for its mate, we gazed up at a very clear sky full of stars. If anything the trip was worth that moment, but as we went to sleep, thoughts changed to the potential sunrise. We woke early the next morning to pack away our gear and head up the mountain, but were quickly taken aback by the shooting star display that was happening before us. It was simply stunning, and after Rob got his Iphone out to show me a stargazing app, we spotted Neptune. 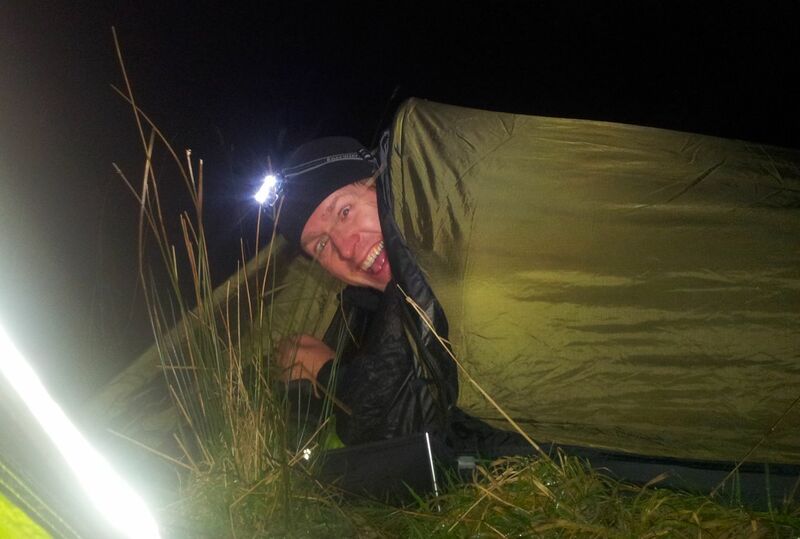 A coffee and porridge later and we were heading up the mountain in the moonlight. It is a different feeling walking in the dark, of course we had been there many times and knew where we were going so we had time to take in everything around us. 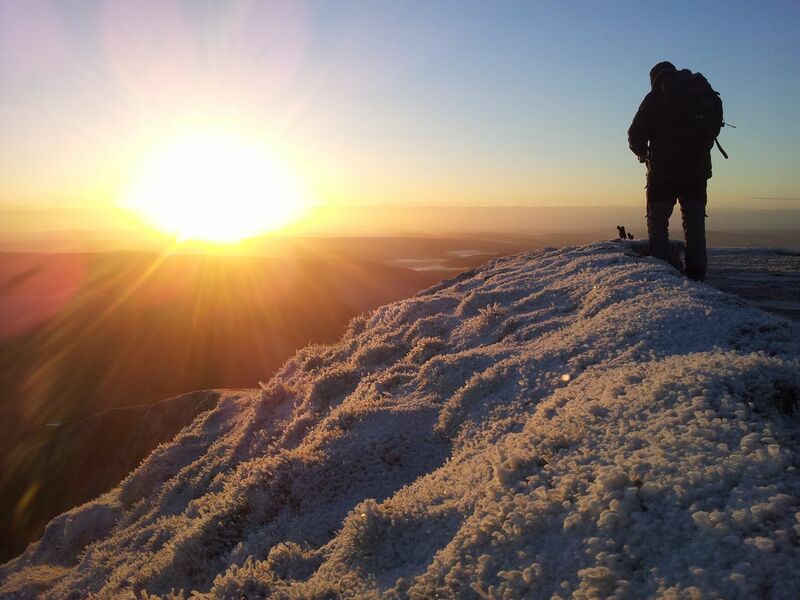 We arrived at the top just in time to see the sun rising over the distant clouds, and with the dusting of snow and haw-frost on the summits, the mountains glowed in glorious orange. We had struck it right and the view was just stunning! We knew there and then that we would be taking pictures of a morning that would be hard to forget, and certainly for me, the best sunrise I have ever watched from the mountains! Just when you think you know a range of mountains well, you climb them in different conditions or times of the day and it all looks fresh and new. So what are you waiting for, stop looking at amazing pictures on social media and go create your own. You wont regret it!